Australia’s Wallabies eased to a 65-3 bonus point Rugby World Cup victory over Uruguay at Villa Park in Birmingham taking them to the top of Pool A.
Australia’s score is the highest yet for the 2015 Rugby World Cup beating Wales’ 54-9 result over Uruguay. The Wallabies scored eleven tries in the contest. The result may have come with a cost though as Will Skelton went off injured. While Australia lead Pool A they have matches remaining against Wales and England who are their most difficult matches in the Pool. Wallabies flanker Sean McMahon scored a brace of tries while returning exile and captain Dean Mumm Drew Mitchell, Ben McCalman all crossed the line. 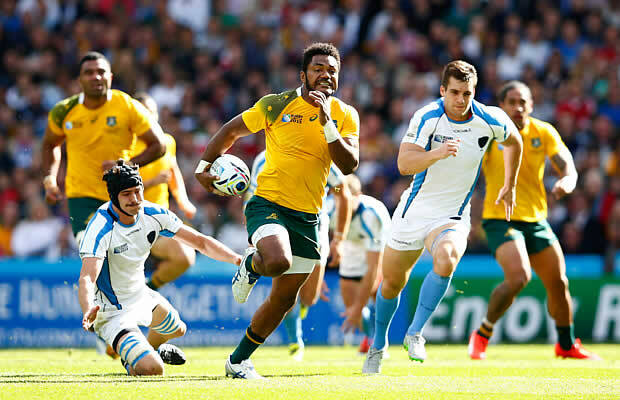 Henry Speight got one of the tries of the tournament at the end of a 65 metre run. Joe Tomane, Dean Mumm, Matt Toomua and Tevita Kuridrani got the others. With the starting XV boasting 14 changes from the side that laboured to an opening 28-13 victory over Fiji, Australia were by far the superior team. Victory left the Wallabies in first place in the &quot;pool of death&quot; on nine points with a points difference of +77. Wales are second, also on nine points (+48pts) and England third on six (+21). Australia play England and Wales over the next two weekends. McMahon, who played a vintage game at openside flanker against an outpowered and outpaced opposition, opened the scoring, peeling off from a driving maul for an easy run-in. From the restart, McMahon broke clear, the ball was played right, Quad Cooper’s smart offload seeing Tomane in for a try with Uruguay looking shaky in defence. The other side of Cooper’s game was witnessed when he caught Uruguay scrum-half Agustin Ormaechea around the neck and flung him to the floor. French referee Pascal Gauzere had no option but to brandish a yellow card. The Australian team completely dominated the set-piece, but poor handling ruined many a clean linebreak. Felipe Berchesi kicked a 24th penalty for Uruguay, just desserts for a dogged display by a team boasting just four professional players and ranked just 19th in the world. As Cooper came back on, a consolidated Wallaby advance ended with skipper Mumm shrugging off the lame challenge of Leandro Leivas to dot down. The requisite bonus point came on the half-hour mark when a slick backline move resulted in Speight sprinting in with a swallow-dive to the corner. Cooper’s deftness was then on display, a beautiful inside pass finding flanker McCalman for a simple run-in. Uruguay’s best break of the half came when Berchesi broke free, a fantastic McMahon tap tackle snuffing out the attack. Mitchell, after an error-ridden first 40 minutes, was first on the scoresheet in the second period, the Toulon winger jinking his way past five defenders for a memorable try. The winger, like clubmate Matt Giteau a beneficiary of the Australian Rugby Union’s relaxation of eligibility rules for overseas-based players, was over the whitewash for a second time four minutes later, running a tightrope down his left wing into the corner. McCalman and McMahon bagged their respective braces as Uruguay struggled to contain the second-string Australian team, albeit one boasting more than 800 caps. There were late tries for centres Toomua and Kuridrani, rubbing salt into the wounds of an outclassed Uruguay, who are yet to play Fiji and England.